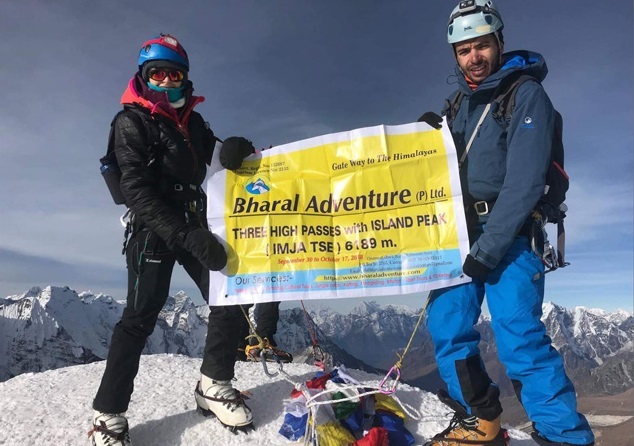 Island Peak Climbing-14 days package is a wonderful gateway to Himalayan climbing that satisfies every aspirant and serious climbers. Originally called Imja Tse, the peak got its name as Island Peak in the early ’80s because of its location. It is in the middle of Chhukung valley and looks like an island on a sea of ice. Bharal Adventure Pvt. Ltd. takes you to the most enthralling Imja Tse Lake and Imja Tse Peak which is also called as Island Peak. The 6,189m high peak offering marvelous views of Mt. Everest, Makalu, Ama Dablam and Nuptse has an impressive highly glaciated west face rising from the Lhotse Glacier. Island Peak Climbing-14 days package is one of the most popular peak climbing destinations in Nepal. It not only offers a fabulous peak climbing experience but also a chance to explore and discover the Sherpa traditions. It’s an opportunity to hike along the highest monasteries and passes in the Himalayan region. The expedition starts with a scenic and thrilling flight to Lukla from where the trek commences. 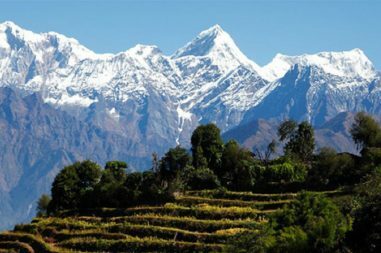 It is an excellent opportunity to observe and experience the Himalayan way of life, flora and fauna and wildlife. This sixteen days package is an extremely exciting and thrilling way of experiencing the Himalayas up-close. Bharal Adventure Pvt. Ltd. offers this package for the aspiring mountaineers to prepare themselves for the further higher mountains climbing exercises. The guests shall be greeted by a representative of Bharal Adventure who is responsible for taking them to their hotel upon their arrival. The dinner comprising of authentic Nepali food is the preliminary firsthand experience of the Nepali culture that the company offers you. Meeting with a crew for trek preparation is also done on this day. An early morning flight from Kathmandu rewarded by breathtaking views of green and white mountains takes the team to the gateway destination, Lukla from where the trek begins. After assembling other crew members in Lukla, the convoy shall commence their trek through the prosperous village of Lukla to Phakding. Hiking through the villages of Benkar, Chumoa, Monjo and Jorsale, the team disembarks the entrance of Sagarmatha National Park. After passing the confluence of Dudh Koshi and Bhote Koshi Rivers, followed by a final steep ascent of about two hours, the team is rewarded with the first sight of Mt. Everest peering over the Lhotse-Nuptse ridge from where it takes an hour and a half hike to reach Namche Bazaar. Exploration of Namche Bazaar itself could be done where the travellers will have a chance to discover and learn about the Sherpa culture, visit the museums, biodiversity of the Everest region and assortment of things related to the first Everest ascenders. Namche is the major trading centre of the region that has restaurants, ATMs, a bakery and colourful market each Friday evening and Saturday. Also, a few hours trip to Everest View Hotel could be taken from where the mighty Everest could be observed in close proximity. Also, a few hours’ side trip to Khumjung Valley could be arranged where a visit to Edmund Hillary School and Khumjung Monastery (a monastery famous for housing the head of the Yeti) could be done. Enjoying the marvellous views of Mt. Everest, Mt. Nuptse, Mt. Lhotse, Mt. Ama Dablam and close up view of Thamserku, the trek from Namche Bazaar to Tengboche comes to an end. The team treks towards Pangboche and then descends to Kayangjuma. After passing through Sansa, the major trail junction to Gokyo valley and Everest Base Camp, the team disembarks at Phunki Thenga for lunch and rest. It requires a short tough climb from here to Tengboche. We will visit the Tengboche monastery, the largest monastery of Everest region nestled in Sagarmatha National Park, during the afternoon around 3 o’clock to witness a religious ceremony. The day begins with the flawless view of the monastery at Tengboche with the mountains at its backdrop. Taking the trail to Debuche crossing over the Imja River, we will take the upper trail to Pangboche village. We visit the Pangboche monastery and take the moderate route to Imja Valley from where we approach the confluence of Lobuche River from where the steepest climb of the day takes the team to Dingboche. Today it's your leisure or rest day. You can chill out this day and prepare for the next day's trek. Your guide will help you out with the planning information for tomorrows journey. The trek to Chhukung begins by walking through the stone-walled fields, Imja Khola valley before walking along the glacier moraines. The views of Lhotse and Ama Dablam keep us company as we walk until we reach Bibre village from where Island Peak comes closer to us. The trail ahead is intersected by icy streams through where we arrive at Chhukung, a small settlement in half an hour from Bibre. The trek to Island Peak Base Camp moves through a fairly steep trail where we first climb south then turn east to the main line of the valley. Then the walk on a winding path below the southern flank of the moraine from the Lhotse Glacier begins from where it continues on a pleasant trail along a streamside. The route to the Amphu Lapcha lies to the south-east. A criss-cross route through the Imja and Lhotse glacier moraines leads to a wide valley flanking the south west side of Island Peak. Waking up at around 12 to 1 am and having the breakfast helps us reach the summit before noon as the strong winds in the highlands in afternoon could become a barrier for a successful summit after that. The trail goes up beyond the base camp for several hundred meters before striking off the steep hillside. The initially sandy path turns to grass becomes becoming boulder strewn again. Climb up the hill takes us to the narrow slope from where the trail enters a steep rock channel. As we climb the rock gully, the route follows a ridgeline leading to an exhilarating and exposed traverse onto the snout of the summit glacier. Here, roping up for the glacier is required because of the several crevasses it contains. The guides will fix a rope wherever necessary from and around here. A steep snow slope will lead us onto the summit ridge where both the fixed rope and man rope will be used for the climb because of the safety reasons. The fixed rope of about 350m is used after successfully climbing on rock, however, the length depends on the season as well as the crevasses. Capturing the picture-perfect view from the summit, we descend back to Chhukung where we have small celebration commemorating the successful scaling of the peak. From Chhuking, retracing the steps down to Imja Khola and up through the forest to Tengboche, we can also plan a visit to the nuns at the Tengboche monastery. After having our lunch here, the walk continues through the hillside blanketed by rhododendron and juniper trees going across the bridge over the Dudh Koshi River following the trail descending rapidly through pine forests from Dudh Koshi gorge to Sansa. Passing through a chorten and encountering (if we are lucky) wildlife such as mountain goats, snow leopards, colourful pheasants, etc., we reach the army camp at Namche Bazaar. 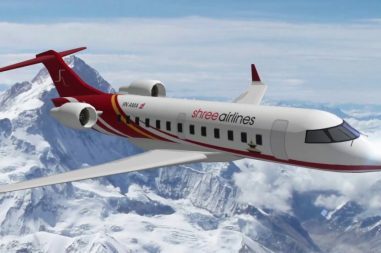 The forty minute early morning flight to Kathmandu enables the team to either plan more sightseeing in Kathmandu or spend the rest of the day relaxing and shopping for souvenirs in Thamel with or without the assistance of a representative from Bharal Adventure. To commemorate the end of the adventurous expedition in the land of mountains, a farewell dinner shall be organized where the guests will have one more chance to indulge in the delicacy of authentic Nepali meal before they plan their next tour to the country. The journey of a lifetime along the Himalayas comes to an end on this day. The guests are accompanied to the airport by one of the representatives of Bharal Adventure approximately three hours before their scheduled flight takes off.